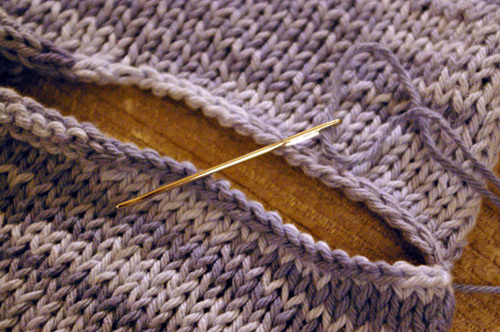 all the little stories» Blog Archive » sewing is really knitting. Why didn’t anyone tell me that sewing in knitting is really knitting with a sewing needle? So, I feel all fancy. I stitched together the shoulder seems for the hoodie! While doing so, I learned how to make an “Invisible Horizontal Seam” (doesn’t that sound impressive?). I couldn’t quite master the “Invisible Vertical Seam” however, so the sleeves remain unstitched. I just watched a video on that at KnittingHelp.com, so I feel a little more confident now. This entry was posted on Wednesday, October 24th, 2007 at 2:45 pm and is filed under just life, knitting. You can follow any responses to this entry through the RSS 2.0 feed. You can leave a response, or trackback from your own site. Oh dude, the vertical seam is high up on my list of cool knitting tricks. Once you’ve got it, it’s MAGIC to progress upwards, zipping that seam shut as you go. MAGIC, I tell you. Hello it was an absolute pleasure to come across, and read your blog. You really have some interesting information that I will have to share with my wife. If your ever looking for fabrics Lauren & I would be more than willing to help. Just let us know. Have a great evening.